Breathe. Inhale…Exhale…find the small pauses at the end of your out breath, just before the breath returns to your body and again just before you let go of the breath. Find the stillness of your breath, and as you notice those small pauses, those brief stillnesses, feel yourself connecting to your breath. 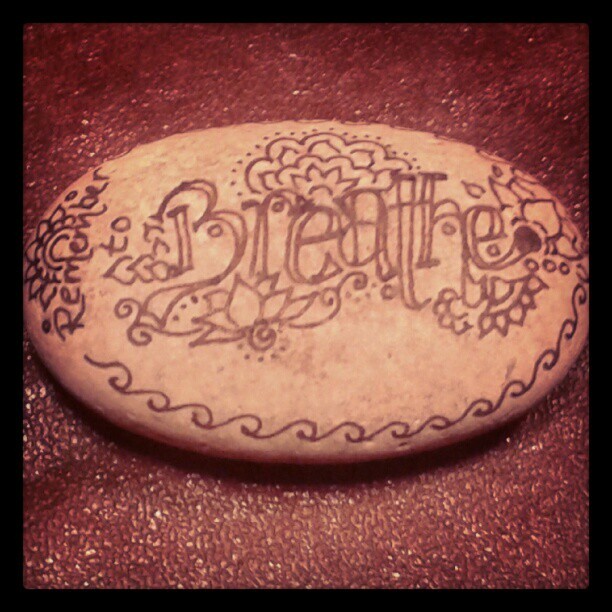 Breathe. Inhale…Exhale. You have all the time in the world. Connect to your breath. Let it connect you to your body. Your breath is your best friend, get to know it. Breathing mindfully is all you really need to know – simply watch your natural breathing rhythm & don’t even try to change or control it. Witness your breath. Connect to your breath, your body, your baby. Keep coming back to your breath. Mindful mothering can start now, with your baby in your womb, sharing your body, sharing your breath. Mindful breathing brings mindful labour & birth, it guides you into mindful mothering. Whether you are pregnant or have recently given birth, whether you have a vivacious toddler or a spirited adolescent, taking some time out to find your quiet centre can be an essential part of being the mother (or father) you want to be. Try this as a meditation or relaxation…take 1 quiet minute or half an hour, whatever you want to spend or what time you can spare will do. Close your eyes, keeping them softly closed, no tension held in your forehead or face, space between your upper & lower teeth to keep your jaw soft, your tongue released away from the roof of your mouth & your teeth. For a moment or two, simply watch the natural rhythm of your breath. As you watch your breath, notice that you connect to your breath, it slows & deepens, and you gently become calmer (it lowers your blood pressure, slows your heart rate and as your breath deepens, you improve your lymphatic drainage, massage your abdominal organs to support effective digestion, and bring more oxygen into your body, helping you to feel more energised & improving your well-being). Now visualise a velvety darkness behind your eyelids, and slowly begin to lay down a golden thread in the soft, serene dark, circling around and gradually inward to create a spiral. Inhale deeply and exhale slowly as you journey from the outer most point and in toward the centre of the spiral. When you reach the centre, rest your awareness at the centre of the spiral. And in the words of the wonderful Snatam Kaur “Breathe, my love, breathe in your quiet centre”. Take as long as you can to connect with your breath, to feel the calm that you can create, to feel the quiet within your heart centre at the innermost point of your spiral. When you are ready, slowly retrace the spiral, gathering in your golden thread, returning your awareness to your physical body by taking a breath to the soles of your feet, another to the crown of your head, breathe into the palms of your hands and to the root of your spine. As you become aware of the space that your body occupies, try to remain gently conscious of the quality of your breath and remind yourself to breathe with freedom & ease, as you did in your quiet centre.